It’s interesting to compare the town politics of East Longmeadow with Longmeadow. While I’m the first to admit that I know very little about the politics in our neighboring town, I found it quite interesting this morning observing election campaign signs as I drove through the town. 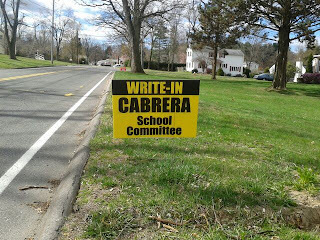 East Longmeadow’s Annual Town Elections are next week and there are a large number of campaign signs by current School Committee member Joseph Cabrera. As you can see in the photo, Mr. Cabrera is seeking voter support as a write-in candidate since he lost in the preliminary election last month wherein 5 candidates were seeking 1 School Committee seat and he finished third. Only the top two candidates are added to the election ballot. Mr. Cabrera was an outspoken supporter of spending an additional $100K for new lights on the football stadium which was approved at a Special Town Meeting attended by only 400 voters. This may be a possible reason for his lack of voter support in the preliminary election when 1000 out of 11,000 voters showed up at the polls. 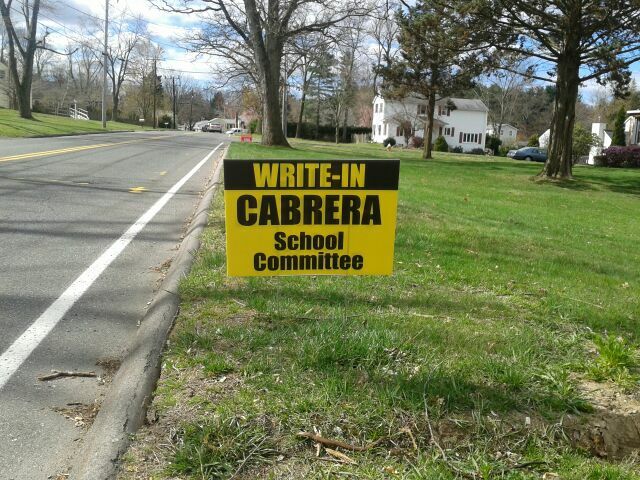 It will be interesting to see how Mr. Cabrera fares as a write-in candidate in the town election next Tuesday, April 10. In Longmeadow, the situation is quite different with 2 Select Board seats and 4 School Committee seats being essentially uncontested. While there is a contested Special Election on May 15 to fill the one year seat vacated by Christine Swanson, both candidates are running again in the Annual Town Elections on June 12. Earlier this year there were three appointments to School Committee seats (see earlier Buzz posts) in which Owen Humphries, James Desroshers and Katherine Girard were appointed. All three of these appointments were a result of resignations by School Committee members. Over the past two years we have had a number of elected officials resign from the School Committee and Select Board. One interesting note is that Gerard Kiernan applied for the three different School Committee vacancies over the past year and was not selected. He is now running in the upcoming election for the open 1 year School Committee seat. His recent experience shows that it is easier to get elected (or self appointed) than appointed in our town. Below are the candidates in the upcoming Special Town Election on May 15 and Annual Town Elections on June 12. Summary… After the June town elections, we will have 4 out of 5 members of the Select Board who have run unopposed and 6 out of 7 members of the School Committee. Jennifer Jester and Mark Gold are the only members of our town leaders who have been elected in a contested election. I applaud the efforts of those individuals who have stepped up to the plate and are willing to commit their energies to our town. However, if we are to be successful as a town with our current form of government, we need to be able to elect leaders that best represent our town residents. Without choice at the ballot box on election day that will not likely be possible. Back in October 2011 I posted a summary about a meeting at the Longmeadow Adult Center explaining a new tax relief measure that was being proposed by John Bowen and the Longmeadow Council on Aging. This new measure was being based upon the Massachusetts Circuit Breaker Tax Credit. After this meeting I did some research about the Circuit Breaker Tax Credit and found that the toughest qualification was being 65 years of age or older in order to be eligible to receive up to $980 from the state of Massachusetts. The Circuit Breaker Tax Credit helps Massachusetts senior homeowners whose real estate taxes, sewer, and water bills combined consumed more than 10% of their total income. The state also helps renters whose water, sewer, and 25% of the rent combined totaled more than 10% of their income. As I continued to review the 10 year old Circuit Breaker Tax Credit, I discovered that it no longer appeared to solely meet its original targeted purpose of assisting seniors who are in financial need. For example, a Longmeadow property owner with an annual income of $35,000 with a modest home assessed at $150,000 and a $500 water/sewer charge would qualify for $0. In contrast a property owner with an annual income of $78,000 (married/filing jointly) with a house assessed at $729,000 and a water/sewer bill of $500 would receive the full $980 tax credit. The circuit breaker tax credit is based upon the actual real estate taxes paid by a taxpayer who is eligible to claim the credit. It is equal to the amount by which the taxpayer's property tax payments in the current tax year, including water and sewer charges exceeds 10 percent of the taxpayer's total income, up to a maximum credit amount for tax year 2011 of $980. 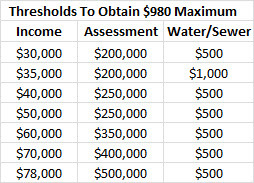 Below is a table showing the income (married/ filing jointly) and property assessment thresholds to obtain the full $980. For a given income level, the above table shows the minimum assessed property value to obtain $980 maximum tax credit at different income levels. This tax credit as structured provides tax relief to high as well as low annual income levels. "Total income" includes some types of non-taxable income, such as social security, retirement, pensions and annuities, cash public assistance, tax-exempt interest and dividends, and certain other income. Check out this spreadsheet to see if you qualify for the Circuit Breaker Tax Credit. In tax year 2009, the most recent tax year for which complete information is available, 80,566 taxpayers received $61.1 million in cash or credits used to lower income tax payments, an average of $759 per taxpayer. For the tax year 2009, there were 353 Longmeadow taxpayers who received a total of $306,342 or an average of $868. In Longmeadow there are almost 3000 town residents over 65 (2010 census) with a median household income of $45,900 (based upon 2005-2009 survey). Based upon this information I would expect that there are many more senior citizens in our town that could qualify for this tax credit who are not doing so. Remember, you do not need to pay Massachusetts income taxes to receive a check. Call your tax preparer today if you think that you might qualify! If you are eligible, you can go back three years and claim the credit retroactively. 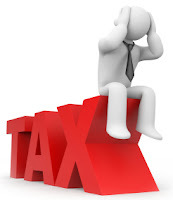 If you owe tax, the credit is deducted from the amount owed. And if you don't owe tax, the state cuts you a check. It's worth taking a few minutes to do the math on this. Here is a link to the 2011 Circuit Breaker Tax Form. John Bowen and the Council on Aging have redirected their efforts and submitted an article that will appear on the Annual Town Meeting warrant (by petition) which does not rely upon the same criteria as the Circuit Breaker Tax Credit.